Vintage parties are making a comeback, with everything from 20s prohibition parties to 50s rock and roll celebrations becoming increasingly popular with party goers wishing to throw a memorable event for their friends, family and colleagues. Silk Street Swing are very excited about the increase in stylish vintage events because we can provide the ideal entertainment to these sophisticated and lively events. Swing music developed in the 1920s and was one of the defining musical styles of the 20th Century. Silk Street Swing have a huge repertoire of songs and tunes from all across this great era of music, from After You’ve Gone to Stormy Weather, Summertime to I Get A Kick Out Of You and many more. Stylish, affordable and dedicated to providing the highest quality entertainment possible to your event requirements, Silk Street Swing is the perfect band to give your vintage party that retro feel. 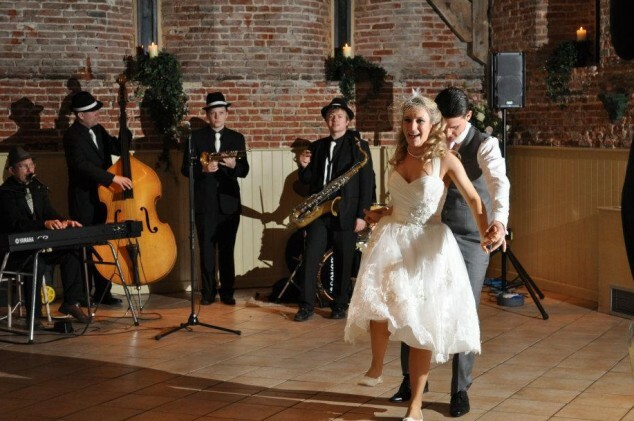 Themed weddings and civil ceremonies are a great way to showcase the era you love, and Silk Street Swing provide the perfect accompaniment to your ceremony, wedding dinner or reception for a special day to remember. We can even play requests if you inform us when making your booking! Whatever vintage event you are planning, we are sure to have a Silk Street Swing band line up to suit your requirements. We can play acoustically or electrically from subtly accompaniment to an intimate gathering to a large, toe-tapping corporate party. Take a look at our line-ups page and listen to the musical clips to get a feel for the Silk Street Swing sound and what we can bring to your event. For extra razzamatazz , hire our talented male vocalist ‘The Blues Doctor’ with any of our existing lineups for that true rat-pack sound. We would love to discuss these options with you after you submit an enquiry quickly and easily from our website or give us a call on 0800 756 5512.